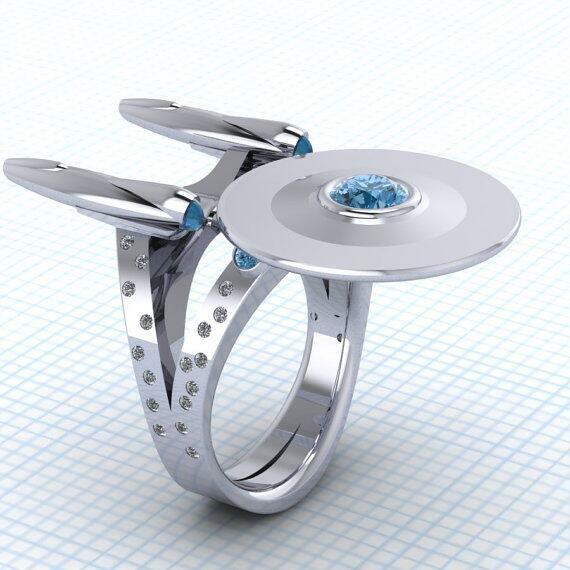 Take a huge step into the final frontier of marriage with this "Star Trek" - inspired ring by Paul Michael Design. (Credit: Paul Michael Design) Pittsburgh-based jewellery designer Paul Michael Bierker of Paul Michael Design created a ring worthy of any captain of someone's heart. The "Boldly Going Somewhere" ring, for sale on Etsy for $595 plus shipping, is available in a choice of metals and gems, including white gold with color-enhanced blue diamonds and white diamond galaxy; white gold with topaz and white diamond galaxy; sterling silver with blue topaz and cubic zarconia; or platinum with blue color-enhanced diamonds and white diamond galaxy. "My rings are about passion," Bierker told Crave. "Love and knowing what your love cares about are key to the symbolism of your relationship. If your significant other loves R2-D2, 'Star Trek,' art deco design, or anything else, why not get them what they want? In my studio, we are custom; we base our designs on what people want." "We have done rings inspired by cartoons, 'Star Wars,' 'Star Trek,' 'Game of Thrones,' 'Hobbit,' you name it," Bierker continued. His elegant, 14-karat white-gold ring in honor of the "Star Wars" droid R2-D2 is set with a ruby eye, custom-cut sapphires, and a choice of center stone. 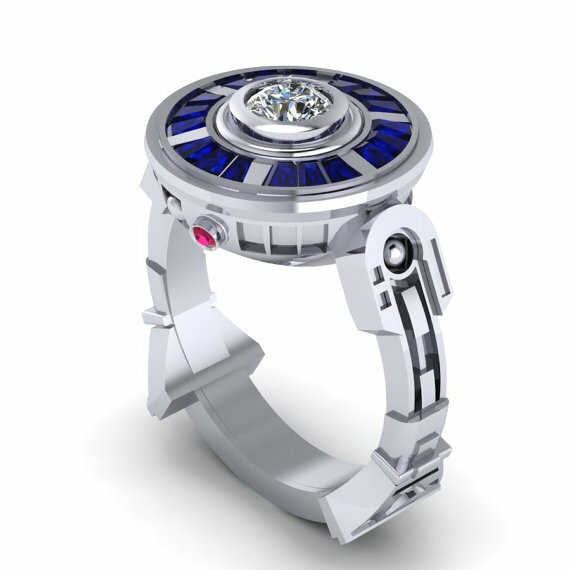 The R2-D2 ring retails on Etsy for $1,895 plus shipping. For fans of Wonder Woman, Bierker designed the WW band, which resembles the famous Amazon's golden tiara, complete with five custom-cut rubies. It retails for $595 plus shipping on Etsy. "I am blessed with incredible clients who inspire me every day," Bierker told Crave. "I have some out-of-the-box 'Doctor Who' stuff in development, some superhero stuff, and additional gamer swag like 'Assassins'- and 'Super Mario'-inspired stuff." Your love will say 'I do' to the R2-D2 ring.